This section discusses performance highlights for selected economies, including the top 10 most competitive, the best performers in each main region, and G-20 economies outside the top 10. 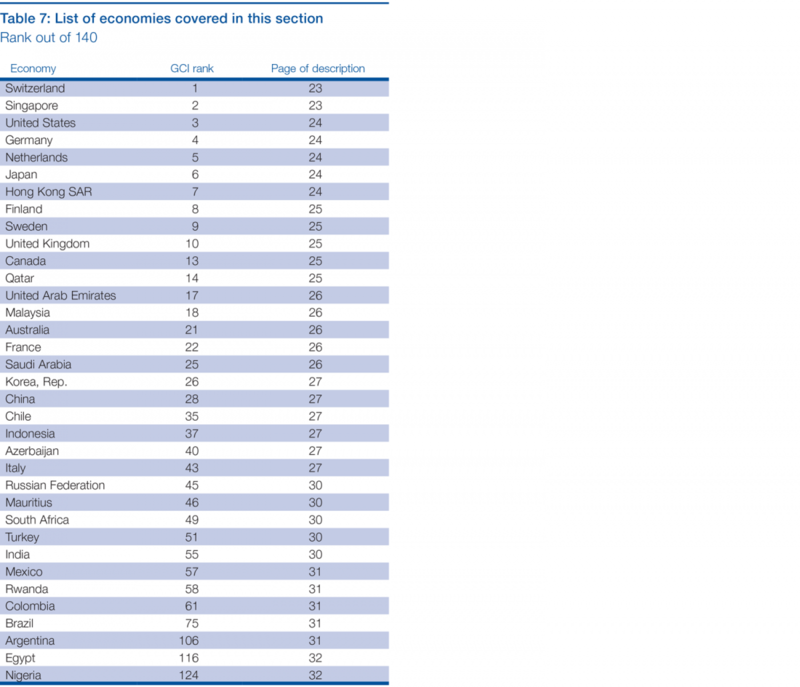 Economies are listed in rank order (see Table 7). Switzerland tops the GCI for the seventh consecutive year. Switzerland leads the innovation pillar, thanks to its world-class research institutions (1st), high spending on research and development (R&D) by companies (1st), and strong cooperation between the academic world and the private sector (3rd). But many other factors contribute to Switzerland’s innovation ecosystem, including the level of business sophistication (1st) and the country’s capacity to nurture and attract talent. Switzerland boasts an excellent education system at all levels and is a pioneer of the dual education system. The labor market is highly efficient (1st), with high levels of collaboration between labor and employers (1st) and balancing employee protection with flexibility and business needs. 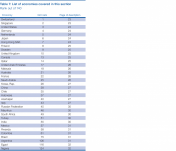 Swiss public institutions are among the most effective and transparent in the world (6th), and competitiveness is further buttressed by excellent infrastructure and connectivity (6th) and highly developed financial markets (10th). Last but not least, Switzerland’s macroeconomic environment is among the most stable worldwide (6th) at a time when many developed countries continue to struggle in this area. These very strong economic fundamentals help to explain Switzerland’s resilience throughout the crisis. Yet recent developments have created a number of downside risks and leave little policy space. These include the sluggish recovery in key trading partner countries; the appreciation of the Swiss franc following the exit of the exchange rate floor; near-zero inflation; and negative real interest rates. Uncertainty about future immigration policy following the referendum against “mass immigration” could undermine Switzerland’s capacity to tap into the global talent pool needed to power its economy. Switzerland must continue to sharpen its competitive edge to justify the high cost of doing business in the country. Singapore ranks 2nd for the fifth year in a row, with one of the most consistent performances of all economies, being in the top 10 in nine out 12 pillars. Singapore remains the best performer when it comes to the overall efficiency of markets, and one of the two economies—together with Hong Kong SAR—ranking in the top three in goods, labor, and financial market efficiency. In particular, Singapore can rely on the most flexible and the second most attractive labor market in the world, although the participation of women in the workforce remains relatively low (75th). With the best higher education and training system in the world (1st, overtaking Finland), Singapore is well placed to increase technological adoption (5th, up two), business sophistication (18th, up one), and innovation (stable at 9th). The economy can rely on top-notch infrastructure (2nd), a transparent and efficient institutional framework (2nd), and a stable macroeconomic environment (12th). In particular, the government produced a large budget surplus equivalent to 4.2 percent of GDP in 2014 (6th largest). The United States retains 3rd place. Although many risks arguably loom on the horizon, the country’s recovery can build on improvements in institutions—public-sector performance is rated higher than in previous years—its macroeconomic environment, and the soundness of its financial markets. The United States’ major strength is its unique combination of exceptional innovation capacity (4th), large market size (2nd), and sophisticated businesses (4th). The country’s innovation capacity is driven by collaboration between firms and universities (2nd), human capital (4th on availability of scientists and engineers), and company spending on R&D (3rd). The United States also benefits from flexible labor markets (4th) and an overall well-developed financial sector (5th). However, as accommodative monetary policy will slowly phase out and the US dollar has strengthened, the country will have to embark on a range of reforms to ensure that productivity growth picks up. These include improving the quality of education (18th), in particular at the primary level, and continuing to stabilize its macroeconomic environment (96th), which must include addressing high health and social security costs and ensuring continued strengthening of the financial system.26 Last but not least, further improvements to the institutional environment (28th) would put growth on a more sustainable footing. Germany climbs by one spot to 4th place this year on the back of strengthened labor and financial market efficiency (up seven places each to 28th and 18th, respectively) and a strengthened macroeconomic environment (up four places to 20th), reflecting its positive budget balance and reduction in government debt, which stands at 73 percent of GDP. Germany excels especially in the more complex areas of competitiveness: businesses are highly sophisticated (3rd), exerting a high degree of control of international distribution (3rd) and employing latest technologies in the production process (3rd). The country’s innovation system (6th) is characterized by high levels of company spending on R&D (6th) and a supportive research environment, including business collaboration with universities (10th) and strong scientific research institutions (9th). This is supported by excellent on-the-job training (8th), ensuring that skills match businesses’ needs; high readiness to adopt new technologies (16th); and successful use of ICTs (11th). The country uses its talent efficiently (11th), although more could be done to encourage greater participation of women in the labor force (43rd). Germany’s economy could also be made more competitive by increasing flexibility in the labor market, which—despite gradual recent improvements—remains low (106th). In 5th place, the Netherlands is up three and back to its highest position ever, last occupied three years ago. It experienced a small but generalized improvement and confirmed its strong performance in areas such as education (3rd), infrastructure (3rd) and institutions (10th). The Dutch economy remains one of the most sophisticated and innovative in the world (5th and 8th, respectively), with an open and efficient goods market. Although improving, the labor market is still a relative weakness (17th), especially when it comes to flexibility of wage determination (131th). Although its macroeconomic environment improved (up 13 places, at 26th),27 the Netherlands has yet to recover from the bursting of its domestic real estate bubble in 2009, which left it with the highest household debt in the eurozone and GDP levels that still remain below 2008 levels. The financial market is still suffering, with the country’s score in this area still one full point lower than it was in 2007. Japan remains in 6th place this year, registering slight improvements in half of the pillars—most notably in the macroeconomic environment, thanks to the return of moderate inflation generated by the increase in the consumption tax. Japan benefits from excellent infrastructure and one of the world’s healthiest workforces, with a life expectancy of over 80 years. The country performs well in the more complex areas of competitiveness: businesses are highly sophisticated (2nd), employing unique products and production processes (1st) with large control over international distribution (2nd) and benefitting from the world’s best local suppliers (1st). Similarly, high-quality research institutions (7th) and company spending on R&D (2nd), coupled with an excellent availability of scientists and engineers (3rd), contribute to the country’s overall highly innovative environment (5th). Japan’s goods and financial markets have experienced a steady and gradual improvement over the past seven years, and are up to 11th and 19th place, respectively, this year, while institutions have been on a steady upward path to reach 13th this year. In the future, it will be critical for the country to strengthen human capital (21st), where it lags behind many other advanced economies. For the first time this year, Japan is not among the top 10 in on-the-job-training. Although labor market flexibility has improved overall (15th), it could be further raised by easing hiring and firing practices (123rd), and a low share of female participation (83rd) shows that the country is failing to use its talent efficiently. Finally, the country remains an early and eager adopter of new technologies (13th) and boasts one of the highest penetration rates of smartphones (5th). A member of the top 10 since the 2012–2013 edition, Hong Kong SAR has now placed 7th for three consecutive editions. Its performance—almost unchanged from last year—is remarkably consistent across the 12 pillars. It continues to lead in infrastructure, ahead of Singapore, reflecting the outstanding quality of its facilities across all modes of transportation. Although slipping from top place, its financial sector (3rd) remains very well developed, with a high level of sophistication, trustworthiness, and stability, and relatively good availability of credit. As with Singapore, the dynamism and efficiency of Hong Kong’s goods market (2nd) and labor market (3rd) contribute to its excellent overall positioning. Hong Kong is also one of the top adopters of technology, in particular ICTs (8th). The challenge for Hong Kong is to evolve from one of the world’s foremost financial hubs to an innovative powerhouse. Innovation is the weakest aspect of the economy’s performance (27th, with a relatively low score of 4.4), and the business community consistently cites the capacity to innovate as their biggest concern. Finland continues to slide down the rankings and is now 8th. Historically characterized by relatively low diversification of economic sectors and export destinations, the Finnish economy has suffered successive shocks to its main industries (information technology and paper) and one of its largest export markets (the Russia). Its trade balance turned negative in 2011, and in 2014 its GDP was still 6 percent smaller than in 2008. Yet robust fundamentals could help Finland to overcome the current crisis. Its public institutions are transparent and efficient (1st), its higher education and training system is among the best in the world (2nd), and its business sector is one of the most innovative (2nd overall and 4th for PCT patent applications per capita). To facilitate the recovery, Finland should fix long-standing rigidities in its labor market (26th), especially the centralized wage-bargaining system (140th, the most centralized in our rankings), which contributes to unemployment (currently at 9.5 percent). Although still one of the best among advanced economies, its macroeconomic environment has also deteriorated significantly during the crisis, with public debt increasing by 20 percentage points as a proportion of GDP since 2006 and public deficit further increasing in 2014 to 2.7 percent of GDP. Sweden climbs one spot to overtake the United Kingdom in 9th place. Like the other Scandinavian countries, Sweden benefits from an efficient and transparent institutional framework (11th), which, paired with an excellent education system (12th), make it one of the world’s top innovators (7th) with more than 300 PCT patents filed per million people (3rd). The innovation ecosystem in Sweden benefits from high levels of technological adoption and ICT usage (11th and 4th, respectively) and a sophisticated private sector (7th). Restrictive labor regulations are still identified as the most problematic factor for doing business, although this is mitigated by very cooperative employer-worker relations (7th) and efficient use of talent (9th). Although the total tax rate on profits decreased in 2013 to 49.4 percent, the first time below 50 percent and down from 57 percent in 2007, it remains high by international standards (112th), representing a potential source of distortion in otherwise competitive and open domestic markets. The United Kingdom improves its performance across the board, but not enough to keep up with its peers, slipping down one place to 10th position. The country has created a good set of conditions for its vibrant service sector to develop and for London to become the epicenter of the European tech and start-up scene. It boasts solid public and private institutions (14th), strong property protection rights (5th), and an efficient judicial system. Thanks to its capacity to attract talent from abroad (4th) and some of the best universities in the world, the United Kingdom can count on a well-educated workforce, contributing to high levels of technological adoption (9th) and ICT penetration (2nd). Although still recovering from the global financial crisis, the UK financial market remains one of world’s best developed, able to provide venture capital and equity financing to start-ups and entrepreneurs. In the long run, the country will have to continue efforts to improve its macroeconomic environment (108th); the government deficit is still very high (5.7 percent of GDP, ranked 118th) and its public debt has doubled since 2007, now accounting for almost 90 percent of GDP (123nd). Canada improves from 15th to 13th position, mainly fueled by a lower budget deficit (based on 2014 data) and a more favorable assessment of its financial market development (4th). Canada’s competitiveness is also built on highly efficient labor markets (7th), good outcomes in health and primary education (7th), and a solid institutional environment (16th), in particular for private institutions (8th). The country’s banking system is considered sound, although exposure to a potentially overvalued housing market could become a risk in the near future.28 To benefit more fully from the recovery in the United States and counter the effects of lower energy prices, Canada should continue to foster innovation at the company level. Company spending on R&D (26th) and capacity to innovate (23nd) are significantly below levels in the United States. Sophistication of businesses, which tend to be concentrated at the lower end of the value chain, will also need to be improved to maintain productivity. Qatar leads the Middle East and North Africa region at 14th position. The country’s main strength is its stable macroeconomic environment (2nd), which is driven by public budget surpluses and low government debt—the result of high windfall revenues from energy exports. However, the recent decline in the price of oil and gas, which is not captured in this year’s edition because of the time lag in the data, may undermine the country’s performance in future. Additional strengths include high efficiency in goods and services markets (5th) and a very high level of physical security (4th). Access to finance is world class (1st on ease of access to loans) and businesses and individuals use latest technologies, including the Internet, widely. To maintain its strong position, Qatar will have to invest its exceptional wealth in the types of innovation and transfer of technology and know-how that can translate into future economic growth. Currently government procurement plays a key role in promoting innovation (1st on government procurement of advanced technology products), yet the patenting rate of Qatari nationals remains low (29th). With imports standing at 30.77 percent of GDP, promoting inward trade and investment could contribute to bringing in new technologies and know-how and enhancing a culture of innovation. The United Arab Emirates (UAE) ranks 17th this year, building on a positive trend over the last five years. Its excellent macroeconomic environment, highly developed infrastructure (4th), and strong institutions (9th) provide a solid base, and the Emirati economy is significantly more diversified than other GCC countries. The UAE has benefitted from high levels of openness to trade and investment (5th on foreign competition), which ensure intense competition and high levels of innovation. Its business environment is welcoming to investment and characterized by regulations that are easy to comply with (3rd), a fairly efficient labor market (11th), and the presence of sophisticated businesses (15th). The drop in rank is a result of the new availability of an indicator on tertiary education, which led to a significant drop in the assessment of higher education and training.29 The country will have to continue its gradual path of fiscal consolidation to ensure that its fiscal position remains strong despite the drop in oil prices; the recent decision to abolish energy subsidies is a step in the right direction. The UAE will also need to strengthen its capacity for innovation (26th), including by upgrading scientific research. Up for the fourth consecutive edition, Malaysia (18th, up two) consolidates its position among the world’s top 20 most competitive economies and remains the highest ranked among the developing Asian economies. It ranks in the top 50 of each of the 12 pillars, performing most strongly in goods market efficiency (6th) and financial market development (9th, although down five this year). The country improves in most pillars, notably by 13 places in technological readiness (47th), which nonetheless remains its weakest feature. Small gains in macroeconomic stability (35th, up nine) are mainly the result of a reduced budget deficit (3.7 percent of GDP), the lowest in six years, although the country has not managed to balance its budget in almost 20 years. Amid the good general assessment, the GCI points to specific areas for improvement, including the low participation rate of women in the labor force. The ratio—59 women for every 100 men—is one of the lowest (118th) outside the Arab world. Reversing a four-year slide in the rankings, Australia is up one to 21st. The country’s performance remains strong across all categories of the Index, particularly in education (9th in basic education and 8th in higher education) and financial market development (7th). Australia leapfrogs 20 places in the labor market efficiency pillar (36th), which has traditionally been its weakest aspect. Despite world-class education and universities, however, it continues to lag behind most advanced economies in innovation (23rd, up two). With global commodity prices set to remain low for the foreseeable future, along with the slowdown in China, the country must diversify further and move up the value chain. France moves up to 22nd place, with encouraging improvements in past areas of weakness—labor and goods markets efficiency, and the macroeconomic environment. The labor market is perceived by the business community as more efficient than in previous years (51st, up 20 places since 2013), in particular on measures of flexibility, though absolute performance remains poor (96th). The country improves on measures of public-sector performance, red tape, and taxation, reflecting recent reform efforts to intensify domestic market competition. France’s competitive edge remains centered on its solid innovative capacity (18th), buttressed by sophisticated businesses (20th), large market size (8th), and high-quality infrastructure (8th). Nonetheless, there is further scope to improve structural rigidities in goods (35rd) and labor (51th) markets: for example, addressing high youth unemployment by improving access to education (44th on the quantity of education), and further improving the effect of taxation on incentives to invest (122nd) and non-tariff barriers (76th). The current recovery—driven by lower oil prices, among other factors—provides a window of opportunity for further macroeconomic consolidation, which will be needed to reduce the persistent budget deficit (95th, at 4.2 percent of GDP, based on 2014 data). Saudi Arabia drops one place to 25th. Its strong macroeconomic environment remains the country’s most distinctive strength—although the recent oil price drop, which is not yet fully reflected in the data, may lead to a less favorable assessment in this respect. Increased spending has already seen the country move from a budgetary surplus in 2013 to a deficit in 2014, and an additional fiscal spending package of about 4 percent of GDP was announced in February.30 It is estimated that Saudi Arabia needs the price of oil to be at about US$100 per barrel to achieve fiscal neutrality.31 The lower oil price will also necessitate further efforts toward diversification and private-sector growth to create employment opportunities. Entrepreneurship and private-sector growth could be supported by reducing administrative barriers to entry (104th), further developing the financial sector (41st), and improving corporate governance standards (55th on efficacy of corporate boards). More focus on broad-based access to quality education (54th) and promoting access to and use of ICTs (56th) could also create employment opportunities. The Republic of Korea remains in 26th place. For the first time in close to a decade, our data suggest an improvement in institutions (69th, up 13 places), an area where Korea remains one of the poorest performers among advanced economies. This improvement in the quality of institutions is driven by improved property rights, a more efficient legal system in challenging and settling disputes, and improved accountability of private institutions. However, policy instability remains a concern for doing business and is ranked as the most problematic factor in this respect. The country registers improvements in the efficiency of the goods market (up seven places to 26th) and domestic competition (up eight places to 34th). Overall, Korea benefits from a stable macroeconomic environment (5th), sound infrastructure (13th), and the highest enrollment rates in the world (1st). However, more needs to be done to leverage the country’s human capital potential: the quality of education (35th) is low compared to other advanced economies, and a highly inflexible labor market (121st) impedes allocation of workers to their most productive uses. Restrictive labor relations rank as one of the most problematic factors for doing business in the country. The country is not fully leveraging its human capital potential, as evidenced by the low female participation in the labor force (91st). Although still high, the country’s innovation potential (19th) has been gradually falling over the years. The financial market also continues to perform poorly (87th), as access to finance across all modes remains difficult. China ranks 28th—unchanged from last year. Its overall performance has barely budged in the past six years. Faced with rising production costs, an aging population, and diminishing returns on the massive capital investments of the past three decades, China must now evolve to a model where productivity gains are generated through innovation and demand through domestic consumption. Box 4 details the performance of China in the GCI and highlights the priority areas on which it must focus to meet the challenges ahead. Chile remains the most competitive country in Latin America and the Caribbean, although dropping two places to 35th. Its strengths include solid institutions (32nd), a stable macroeconomic environment (29th), well-functioning financial markets (21st), high technological readiness (39th), and widespread uptake of ICTs (47th). The data suggest a downward trend in the efficiency of the goods market (40th, down 6 places) and labor market (63rd, down 13 places), with increasingly rigid hiring and firing practices (110th, down 44 places). Restrictive labor regulation is identified as the most problematic factor for doing business in Chile. In its transformation toward a more diversified and knowledge-based economy, Chile will also need to address long-standing issues such as its education system, specifically the overall quality of primary education (108th) and math and science education (107th). Higher education and training is in much better shape (33rd), but Chile must do more to improve its capacity to innovate (85th) in areas such as R&D (92nd) to diversify and foster robust growth. After leapfrogging 16 places in the past two years, Indonesia posts a performance almost unchanged from last year (37th, down three) and remaining uneven across the different categories of the Index. Under new leadership, Southeast Asia’s largest economy still faces major challenges in the basic areas of competitiveness, including infrastructure (62th, down six) and institutions (53rd, down two). Our data suggest that efforts to tackle corruption—a priority for the previous as well as the current administration—are paying off, with Indonesia improving on almost all measures related to bribery and ethics. Another area of concern is public health (96th, up three), with the incidence of communicable diseases and the infant mortality rate among the highest outside sub-Saharan Africa. Lack of labor market efficiency remains the weakest aspect of the country’s performance (115th, down five), the result of persisting rigidities in wage setting and hiring and firing procedures. The macroeconomic situation remains satisfactory (33rd, up one), thanks to a moderate government budget deficit of around 2 percent of GDP, low debt levels, and a high savings rate. The fiscal situation could worsen, though, because depressed energy prices lead to lower proceeds from oil exports. Azerbaijan scores highest in its region (40th), having weathered the recent crisis better than neighboring economies, yet it declines two places. It benefits from a strong macroeconomic environment (10th), characterized by low inflation and favorable public finances. However, the recent decline in the price of oil and gas, which is not captured in this year’s edition because of a time lag in the data, may have an impact on the public budget. The country also boasts a relatively efficient labor market (30th). On the less positive side, Azerbaijan faces two main challenges to further development. First, corruption is still the most problematic factor for doing business; and second, its financial sector is still underdeveloped (114th). This is particularly problematic for a country that needs private investments to diversify its economy. At a time when commodity prices are projected to remain relatively low, diversification and the implementation of market-based policies will be particularly important to achieve long-term growth. Italy is in 43nd, up six positions. After a positive first quarter, it is forecast to return to growth for the current year, fueled by increasing domestic demand, expansionary monetary policy in the euro area, and some progress in implementing structural reforms: it is up 10 places in efficiency of the labor market, although starting from a low base, and has put more emphasis on fostering companies’ innovation (32st, up three places). Although Italy has begun to improve the fundamentals needed for long-term growth, its recovery is still brittle. It needs to continue implementing structural reforms to improve productivity, which remains low compared to other European countries as a result of long-standing constraints such as burdensome red tape (139th) and labor market inefficiency (126th). Access to finance remains difficult for firms, as financial efficiency continues to deteriorate (117th): banks are still under pressure because of nonaccrual assets, while the large public debt (136th) continues to impact financing conditions and crowd out private investments. The Russian Federation improves eight places to 45th, although this is explained mostly by a major revision of purchasing power parity estimates by the IMF, which led to a 40 percent increase in Russia’s GDP when valued at PPP. At the same time, the country improves on some market efficiency aspects, such as the regulatory business environment and domestic competition (96th), reflecting the government’s efforts to improve domestic conditions for doing business.32 Import tariffs have been significantly reduced as an effect of Russia’s accession to the World Trade Organization in 2012. However, the recession following the 2014 currency crisis has already dented the country’s macroeconomic environment, with rising inflation and worsening public finances. This rather pessimistic outlook is compounded by weakening domestic demand, economic sanctions on the part of certain countries, and the uncertainty regarding future prices for mineral commodities. Tackling structural weaknesses in institutions (100th), financial market development (95th), and goods market efficiency (92nd) will be necessary to achieve higher prosperity beyond the current downturn—for Russia itself and for the other economies in the region to which it is strongly connected. The decade-long improvement of Mauritius comes to a halt this year with a fall of seven places to 46th. Small improvements in the basic factors for competitiveness—institutions (34th, up one), infrastructure (37th, up five), and higher education (52, up two ) are offset by declines in the efficiency of labor (down by five places to 57th) and the financial market (down by eight places to 34th). Despite this, Mauritius remains sub-Saharan Africa’s most competitive economy, ahead of South Africa in 49th. It boasts the region’s best infrastructure (37th), most healthy and educated workforce (63rd on health and 52nd in higher education and training), and most efficient goods market (25th). Institutions are a further asset (34th). However, as the country transitions moves up the development ladder, more needs to be done to unlock the areas of competitiveness conducive to a knowledge-driven economy: higher education, especially its quality; the use of ICTs and ability to absorb new technologies (65th), where it has steadily declined over the past decade; the capacity to innovate, about which business leaders are particularly concerned; and an inadequately educated workforce. South Africa climbs seven places to reach 49th, reversing its four-year downward trend thanks largely to increased uptake of ICTs—especially higher Internet bandwidth—and improvements in innovation (up by five places to 38th), which establish the economy as the region’s most innovative. South Africa also hosts the continent’s most efficient financial market (12th) and benefits from a sound goods market (38th), which is driven by strong domestic competition (28th) and an efficient transport infrastructure (29th). It further benefits from strong institutions (38th), particularly property rights (24th) and a robust and independent legal framework. Reducing corruption (76th) and the burden of government regulation (117th) and improving the security situation (102nd) would further improve institutions. The country also needs to address its inefficient electricity supply (116th) and inflexible labor market (107th). Even more worrisome are health (128th) and the quality of education (120th), where higher secondary enrollment rates will not be enough to create the skills needed for a competitive economy. Turkey drops six places to 51st. This result has been driven by a general decline in almost all factors driving competitiveness, with 10 out of 12 pillars registering a lower score than in the past edition. The assessment of institutions experiences the most severe drop, falling to 75th. The country’s delicate political phase (elections took place in June 2015) along with the geopolitical conflicts the country engaged in have set a climate of uncertainty that tends to hold back private investments, especially those coming from international investors, which are crucial for Turkey’s development. Investments have also been restrained by the uncertainty linked to a high level of inflation (8.9 percent, well above policy targets) and by a slight decline in the efficiency and confidence in the local financial sector (64th). Inflation has been driven by loose monetary policy, which has attempted to make up for lack of progress on structural reforms. In particular, policy should address the excessive reliance on external financing and the rigidity and inefficiency of a labor market (127th) that has been a drag on productivity for a long time. The investments that have been made to improve the transport infrastructure (23rd) and the relative good performance in the efficiency of the goods market (45th) only partially offset the lack of structural reforms that are indeed crucial to sustain Turkey’s long-term competitiveness. After five years of decline, India jumps 16 ranks to 55th place. This dramatic reversal is largely attributable to the momentum initiated by the election of Narendra Modi, whose pro-business, pro-growth, and anti-corruption stance has improved the business community’s sentiment toward the government. The quality of India’s institutions is judged more favorably (60th, up 10), although business leaders still consider corruption to be the biggest obstacle to doing business in the country. India’s performance in the macroeconomic stability pillar has improved, although the situation remains worrisome (91st, up 10). Thanks to lower commodity prices, inflation eased to 6 percent in 2014, down from near double-digit levels the previous year. The government budget deficit has gradually dropped since its 2008 peak, although it still amounted to 7 percent of GDP in 2014, one of the world’s highest (131st). Infrastructure has improved (81st, up six) but remains a major growth bottleneck—electricity in particular. The fact that the most notable improvements are in the basic drivers of competitiveness bodes well for the future, especially the development of the manufacturing sector. But other areas also deserve attention, including technological readiness: India remains one of the least digitally connected countries in the world (120th, up one). Fewer than one in five Indians access the Internet on a regular basis, and fewer than two in five are estimated to own even a basic cell phone. Mexico progresses four places to 57th, despite some deterioration of the institutional environment, thanks to improvements in the efficiency of financial markets (up 17 places to 46th), business sophistication (up eight places to 50th), and fostering innovation (59th). The country’s competitiveness also benefits from an efficient goods market with enhanced, albeit low, level of competition (99th) and a large market (11th)—Mexico is the second largest country in the region. These results signal that recent reforms are bearing fruit, but challenges remain. Despite some improvement in the labor market (up seven places to 114th), rigidities are still a problem, as are weak public (115th) and private (78th) institutions—which reflect the fact that corruption is considered the most problematic factor for doing business. Rwanda continues its five-year upward trend, placing 58th and improving in seven out of 12 pillars. It has improved in business sophistication (up by 15 places to 69th) and financial markets (28th), with confidence increased by improved regulation of securities exchanges (46th) and the degree to which collateral and bankruptcy laws protect the rights of borrowers and lenders. The country benefits from strong public and private institutions (17th) and efficient markets: a flexible labor market (12th) and high female participation in the labor force (3rd) help Rwanda to rank 8th overall in labor market efficiency, though pay and productivity have to be better aligned (60th). However, basic weaknesses still need to be tackled: despite improvements, infrastructure (97th) is hampered especially by electricity and telephony (112th), while the workforce’s health (108th) and higher education (120th) remain low. Colombia rises in the rankings for the second consecutive year, gaining five places to rank 61st thanks largely to an impressive amelioration in financial market development (up 45 places to 25th). The country’s performance is relatively stable across other pillars, with slight improvements on most dimensions compared to last year, including business sophistication (59th) and health and education, albeit at a low position (97th). Colombia benefits from a relatively large market size (36th) and good macroeconomic results (32nd) by regional standards. Nonetheless, further improvement in the quality of the education system, especially in math and science (117th), is crucial to deliver the capacity to innovate (93rd) and diversify the economy. Other areas for improvement are the country’s institutional framework, especially public institutions (125th), with corruption (126th) and security (134th) remaining dire. Structural reforms to foster competition (127th) and improve infrastructure, specifically the overall quality of transport (98th), would further enhance competitiveness. Brazil continues its downward trend, dropping to 75th amid low prospects of growth and deteriorating terms of trade.33 The country’s performance is uneven across the Index. Brazil’s most important competitiveness strength is its extremely large market size (7th). It benefits from a relatively high level of technological readiness (54th), especially ICT use, along with sophisticated businesses (56th), and it registered a significant improvement in the quality of its air transport and infrastructure (95th, up 18 places). However, it deteriorated in nine out of the 12 pillars. With a large fiscal deficit and rising inflationary pressure, Brazil’s weak macroeconomic performance (down to rank 117th) is negatively impacting the country’s competitiveness. Corruption scandals have undermined trust in institutions, both public (122nd, down 18 places) and private (109th, down 38). Important reforms are also needed to provide higher-quality education (132nd). Argentina drops two places to 106th with continuing poor performance across different dimensions of the Index. Exceptions are market size (27th), uptake of ICTs (52nd), and higher-level education and training (39th), which is among the best in the region; however, performance is poorer on the overall quality of education (108th) and the quality of math and science (113rd). A weak macroeconomic environment (114th) and inefficient financial sector (132nd) hold back investment, with business leaders considering inflation and foreign currency regulations to be the two most problematic factors for doing business in Argentina. The country faces a deep institutional crisis, scoring poorly on property rights (133rd), ethics and corruption (137th), undue influence (135th), public-sector performance (138th), and corporate ethics (138th). The quality of infrastructure (122nd) is also among the lowest in the region. Egypt, at 116th, moves up in the rankings for the first time since the Arab Spring. This reflects a more positive assessment of the country’s institutions (87th), in particular higher levels of physical security (up by seven places although still, at 133rd, an important hindrance to economic growth), a more efficient judiciary in settling business disputes (up by 23 places), and better protection of property rights (up by seven). Smaller improvements are registered on the macroeconomic environment (up four) and financial market development (up six). The upward movement reflects recent reforms, including a reduction of energy subsidies, tax reforms, and a strengthened business environment, as well as greater political stability after years of turmoil. Continued reforms are needed to create favorable conditions for private-sector growth, which will be crucial for job creation and hence social cohesion. These include more openness to trade and investment (130th on foreign competition), including reduction in tariff duties (132nd), non-tariff barriers (105th), and a more favorable environment for foreign direct investment. Continued efforts to strengthen the financial markets (119th) and investment in skills and education (111th) will further support private-sector growth. Nigeria improves by three places to 124th. Last year’s revision of GDP is reflected in an increase in market size (up by eight places to 25th), lower government deficit and debt, and decreased national savings. Improvements in property rights, the efficiency of the legal framework to settle and challenge disputes, and the accountability of the private sector lift the country’s institutions up by five places, albeit remaining low overall (124th). The picture is mixed on efficiency of the goods market (100th), where a less competitive domestic environment outweighs improvements to encourage foreign competition; the financial market (79th), where banks are rated as relatively sound but access to finance remains problematic; and the labor market, which is one of the region’s most flexible (18th) but is dragged down by an inefficient use of talent (68th) and a comparatively low female participation rate (87th). Priorities include investment in infrastructure (ranking 133rd and singled out as the most problematic factor for doing business) and human capital, where poor health in the workforce (134th) and inefficient higher education (128th) holds the country back from fulfilling its potential. 27 This is partially the result of a revision of public debt data by the International Monetary Fund. 28 Farugee and Lusinyan 2015. 29 It has to be noted however, that the indicator is likely to underestimate tertiary enrollment in the United Arab Emirates as well as in other GCC economies, because students who study abroad are not included. 32 Russia made starting a business easier by eliminating requirements to deposit charter capital before registering a company and the requirement to notify tax authorities of the opening of a bank account.